Fitness professionals from all over the world, from Finland to Peru, South Africa to California attended this innovative ECA World Fitness conference showcasing new products, workouts, and lectures. The high-quality event bustled with enthusiasm and inspiration but no product could outshine the buzz and hype organically generated by the JumpSport Fitness Trampoline! In spite of the inaugural workout class being taught on the lower level, participants clamored into the room and onlookers filled the hallway. The vertical blinds around the windows of the room were opened so that curious passer-bys could sneak a peek at this fresh and totally fun trampoline workout! Abbie Appel led the group into a frenzy of cheers and smiles as she demonstrated a new way of doing cardiovascular workout! On Friday, over twenty trampolines studded the luxurious pool area of the Deauville Hotel in Miami Beach, Florida. Michelle Mascari of Lifetime Fitness coached a packed demo to conference attendees and hotel guests alike. The turquoise sky, azure ocean and swaying palm trees provided the perfect backdrop to an awesome demo that connected professionals and enthusiasts to the product. Sunday’s trampoline class attracted over fifty people! Participants lined up a half hour early to ensure their spots. Once again Michelle Mascari held court, bringing a live DJ. Despite a long weekend of classes and workshops, Ms. Mascari along with Team JumpSport, delivered a high-energy workout that provided a body-blasting “second wind,” inspiring booming vocal excitement and a mass endorphin release. 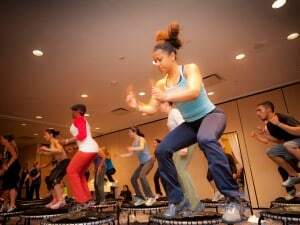 Sports coaches, government affiliated personal trainers, group fitness professionals and exercise enthusiasts were wowed by the effectiveness of the trampoline and what it could do for their teams, clients, and themselves. To everyone’s surprise and de-light, every participant was given a trampoline to take back and share the joy and benefits of the JumpSport Fitness Trampoline! The response to this gesture was incredible. The JumpSport Fitness Trampoline movement is contagious, so stay tuned and look out ECA, New York!